A book quarter-bound in leather, with paste-paper (as opposed to marbled-paper) sides. The text of Memoirs of a Woman of Pleasure peek out from the covers of Samuel Rogers’s The Pleasure of Memory. 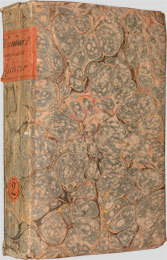 An example of a book-binding entirely covered in marbled paper. One of the most common methods of decorating the endpapers of hand-bound books is marbling. Although collectors and others who are used to handling and viewing books of the past often take little notice, to those who haven’t encountered marbled paper before, its splendid variety of patterns and colors can be an eye-opening experience. Far from being a recent decorative innovation, the marbling of paper dates back to at least 1118 a.d. and a Japanese publication whose title translates as Poetical Works of the Thirty-six Men. The paper was produced by a method known in Japan as suminigashi, or “a pattern formed by floating ink,” which aptly and concisely describes the nature of the process. Marbled paper is created by floating colors on the surface of water, working the colors into patterns, and then transferring the pigments onto a sheet of paper. Books covered with these geometric and random patterns of color can be quite striking. Marbled paper was in use in the Near East in the succeeding centuries after its documented appearance in Japan, though it’s not known whether it developed independently or if it migrated westward from Japan or China. European travelers must have seen marbled paper when they visited Persia and Turkey in the sixteenth century, and by the early seventeenth-century, similar paper was being produced in Germany. The craft of paper marbling spread quickly to France, and eventually to the rest of Europe. John Evelyn demonstrated marbling to the Royal Society in 1662. Before marbling became an established trade in England in the late eighteenth century, marbled sheets imported from the Continent proved very popular among bookbinders, who used them frequently for endpapers and the coverings of bindings. Marbling arrived in the United States in the early nineteenth century. In addition to blank paper, artisans also marbled surplus or waste sheets, and it is this practice of recycling that created some of the marbled sheets most prized by Americana collectors. Sometime after 1800, a still-unidentified printer in New England undertook an edition of John Cleland’s notorious Memoirs of a Woman of Pleasure (known colloquially as Fanny Hill, after its main character). The title-page falsely identified it as having been produced in “London: Printed for G. Felton, in the Strand, 1787.” For reasons that are still the subject of speculation, the printer abandoned the edition, apparently after completing the first part of the book. The printed sheets were marbled (“overmarbled” is the technical term) and used to cover the plain board bindings of books of all kinds. Over the years, the marbling has worn away, revealing—on a variety of much more innocent books, ranging from textbooks to religious works—portions of the beginning of the story of Fanny Hill. A number of these books survive, and they appear on the market from time to time, where they are acquired far less for their texts than for what is revealed beneath the marbling. While marbled paper was widely used on books well into the nineteenth century, its popularity slowed after the mechanization of new-book binding. Marbling never died out completely, however, and it remains popular today both for custom bookbinding and as a craft practiced by people of all ages. Paper marbling seems magical, and yet it is improbably simple. The basics haven’t changed very much over the past several hundred years. It still involves depositing bits of color on the surface of water (to which a thickening agent has been added) and arranging those colors, through the use of combs or other implements, into patterns that are then transferred to a sheet of paper. It is fairly simple to follow a manual and produce a sheet of marbled paper, just as one can also follow instructions and produce a sound by drawing a bow across the strings of a violin. In each case, one will get results, but the results may not be pleasing. With marbling, it takes practice to learn the proper amount of thickening agent to add to the water so that the colors will float and some experimentation to create pleasing patterns. Placing and removing the paper to be marbled from the surface of the water also requires delicacy. With diligence and experience, the results do improve, and paper marbling can become an addictive hobby. Many marbled papers used for endpapers and bookbinding have similar designs. Applying the colors to the water’s surface in a set manner and manipulating them with specific combs, as described in marbling manuals, create standard patterns. While the sheets will exhibit some variation, an experienced practitioner can create very similar and consistent designs. Not all of the decorated paper found in books is “marbled.” Some designs are produced using woodblocks or engraved plates, while others have patterns created by a process involving colored paste. These “paste papers,” as they are known, are also quite common on book bindings. The standard history of the field, which was of great help in the writing of this article, is Richard Wolfe’s Marbled Paper: Its History, Techniques, and Patterns (Philadelphia: University of Pennsylvania Press, 1990). Wolfe covers both Eastern and Western marbling, with particular emphasis on marbling in Britain and America. His detailed notes are essential for anyone doing research in the field. A more general account of several types of decorated paper is Rosamond B. Loring’s Decorated Book Papers: Being an Account of their Designs and Fashions (Cambridge: Harvard College Library, 1942). Later editions, edited by Philip Hofer, contain additional essays about Loring’s life and work. They do not, however, include original samples of marbled and decorated papers included in the 250-copy first edition. No list, however brief, of reading about marbled paper should exclude mention of some of the many works on the subject published by the Bird & Bull Press of Henry Morris: The Mysterious Marbler (1976); Karli Frigge’s Life in Marbling (2004); and The World’s Worst Marbled Papers (1978), complete with paper samples. Joel Silver is Curator of Rare Books at the Lilly Library.